(Belated) Congratulations to Dr Po Jen Yap on his promotion to full Professor earlier this year. Professor Yap's specialises in constitutional and administrative law. A LLB graduate of National University of Singapore, he received a PhD degree from the University of Cambridge, apart from obtaining LLM qualifications from both Harvard Law School and University College London. He is the recipient of HKU's 2016 Outstanding Young Researcher Award. He joined HKU in 2006. He is a prolific researcher and has made important contributions to the literature on constitutional law in Asia. 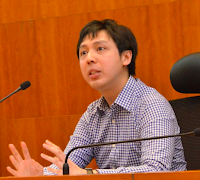 His first sole-authored monograph, Constitutional Dialogue in Common Law Asia, was published by Oxford University Press in 2015, for which he was awarded HKU's University Research Output Prize in 2016. His second sole-authored monograph, Courts and Democracies in Asia, was published by Cambridge University Press in October 2017.​ He has been the Principal Investigator of two RGC General Research Fund (GRF)​ projects. He is currently editing a special issue of Hong Kong Law Journal to mark the 20th anniversary of Hong Kong's Basic Law. He is also organising a collaborative project on proportionality in Asian jurisdictions. Leading scholars in this area will convene at HKU in December 2018 to present and discuss papers which are to be published in an edited volume by an international publisher. 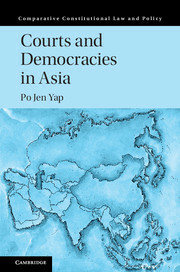 This project will complement a similar project led by Professor Yap on the judicial review of elections in Asia which led to the publication of an edited volume published by Routledge in 2016. Congratulations to Prof Dr.Po for making substantial contribution in the sphere of legal studies and research.He is rightly rewarded as Professor an younger age.He has very promising future.It would be a privilege to participate in Colloborativ project on proportionality in Asian Jurisdiction and share my views in Meet at HKU in December 2018.